At eighteen, Soledad couldn't get away fast enough from her contentious family with their endless tragedies and petty fights. Two years later, she's an art student at Cooper Union with a gallery job and a hip East Village walk-up. But when Tía Gorda calls with the news that Soledad's mother has lapsed into an emotional coma, she insists that Soledad's return is the only cure. Fighting the memories of open hydrants, leering men, and slick-skinned teen girls with raunchy mouths and snapping gum, Soledad moves home to West 164th Street. As she tries to tame her cousin Flaca's raucous behavior and to resist falling for Richie -- a soulful, intense man from the neighborhood -- she also faces the greatest challenge of her life: confronting the ghosts from her mother's past and salvaging their damaged relationship. Evocative and wise, Soledad is a wondrous story of culture and chaos, family and integrity, myth and mysticism, from a Latina literary light. Angie Cruz was born and raised in the Washington Heights section of New York City. She is a graduate of SUNY Binghamton and received her MFA from New York University. Her fiction and activist work have earned her the New York Foundation of the Arts Fellowship, the Barbara Deming Memorial Fund Award, and the Bronx Writers' Center Van Lier Literary Fellowship. Cruz lives in New York City. She is the author of Soledad. 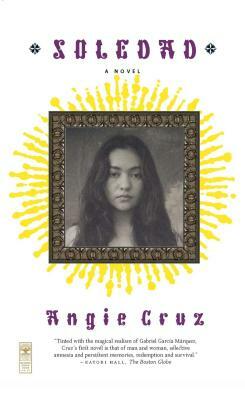 Visit the author at www.angiecruz.com. Katori Hall The Boston Globe Tinted with the magical realism of Gabriel García Márquez, Cruz's first novel is that of man and woman, selective amnesia and persistent memories, redemption and survival. Dodie Bellamy San Francisco Chronicle A vivid, breathing cityscape teeming with raw beauty, danger, and magic. Mark Rozzo Los Angeles Times Nobody's ever really given us such a revealing look at New York's Dominican population before...Cruz, in this determinedly real yet often magical novel, offers canny insights into family life.